Jim Bariesheff from CoreEnviro Solutions holding a nest found in a roof void at Gordon last season. Photos: Supplied. As the weather warms up, European wasp queens are starting to come out of hibernation as the aggressive stinging insects start to establish new nests for the summer months. Wasp specialists are calling on Canberrans to report any early sightings of European wasps in their neighbourhood after the nation’s capital experienced the biggest wasp season on record last summer. 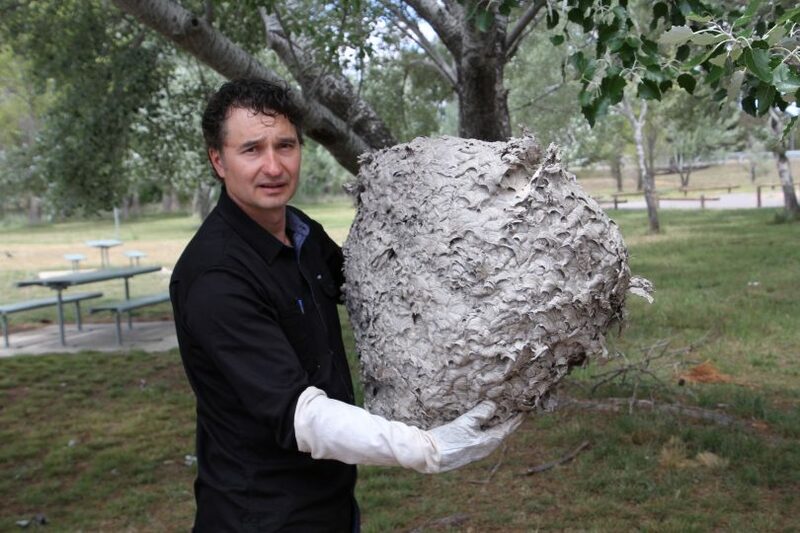 The 2017-18 season saw a record number of European wasp nests in Canberra, with 1,052 nests treated in the ACT. European wasp hotspots last summer included Fyshwick with 66 nests, Kambah with 31, Yarralumla with 27 and Dunlop with 26 while Macgregor, Forde and Latham also had high numbers of reported nests. Wasp specialists believe the record number of reported nests was due to milder, drier winter, which allowed European wasp queens to survive and therefore enabled them to establish their nests much earlier than previous years. Entomologist Dr Philip Spradbery said it was too early to tell if this summer’s wasp season would see a further population growth. “We cannot predict yet what the coming season will be like because we do not have any information,” Dr Spradbery said. “Last year was the biggest season on record in Canberra and one would expect that perhaps this season will be just as big. Pest and weed officer at CoreEnviro Solutions Jim Bariesheff said with another dry and warm winter now over, he is preparing for another busy wasp season. “We have come across a few nests that were treated late in winter but potentially, there are still nests out there that have not been treated,” Mr Bariesheff said. “We have also had over 100 queens reported to us so far this spring. A new mobile app has been released to assist residents when reporting nests and sightings, with an easy-to-use GPS mapping tool that allows the user to report a nest or sighting by dropping a pin on the location. It also provides access to camera capability when reporting nests, identifying insects, arachnids and more. The government advises people to stay clear of nests, report them to the eWasp hotline on 6258 5551, or use the new app and call a pest control company as soon as possible. The European wasp is the same size as the honey bee — about 12 to 16mm long. The wasp is less hairy and folds its wings back at rest. European wasp queens have identical markings and colouring as the worker wasp but have a larger abdomen and can grow up to 20 millimetres in length. If anyone comes across individual wasps, they are encouraged to treat them with a registered insecticide. It is recommended that established nests are treated by a qualified pest controller to avoid any possible stinging incidents and to ensure the nest is properly controlled. 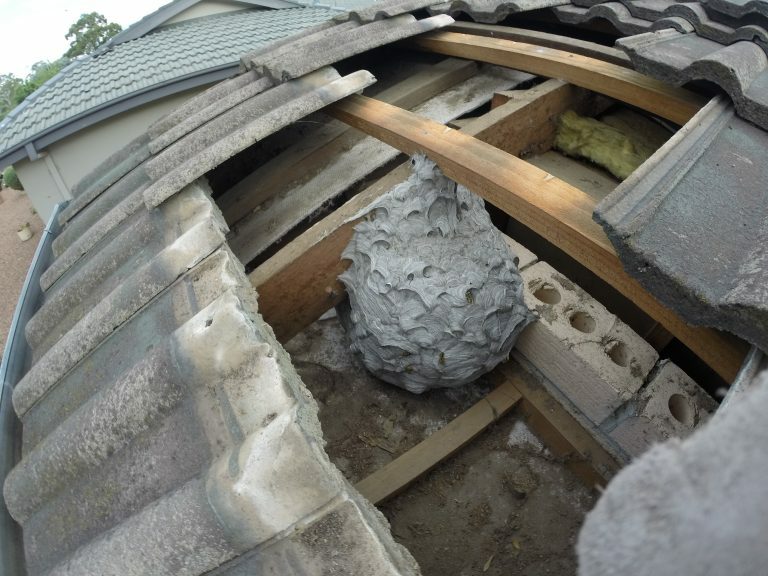 European wasp nests are often hidden, the most common nesting sites in wall cavities, a hole in the ground, roofs and even in conifer trees. When an eWasp queen makes her nest in one of these locations, a steady stream of wasps will be seen leaving and returning to the nest as the day warms up. If threatened or the nest is disturbed, European wasps emit an alarm pheromone summoning the rest of the colony to attack. 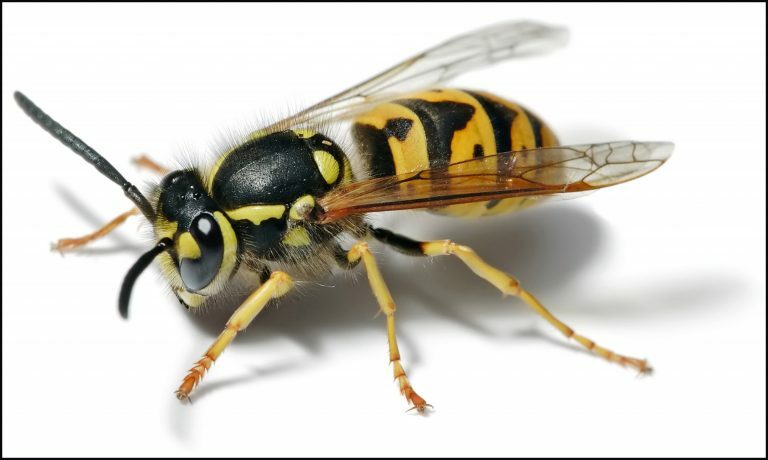 The European wasp is more aggressive than bees and will attack when their nest is threatened or disturbed. Unlike bees, wasps can sting more than once, and do not die after stinging. The sting causes a burning pain and swelling. If stings are multiple, a more severe systemic reaction may occur. If stung, a cold pack may be used to relieve the pain. If there is evidence of a more severe reaction or the victim is known to be allergic to wasp and bee venom, medical attention should be sought immediately.